Addicting. That’s the best word to describe these. French fries are not commonly seen on my plate, they don’t do much for me and there is certainly no nutrition to them. But these, these are different. I’ve seen this recipe before but passed it over on several occasions. I finally decided to give it a whirl when I had no other vegetable to go with dinner. Then I had them the next night, and the next, until I was making a fresh batch for every lunch and dinner for 3 weeks. The best part is, you can cut up several squash and store the uncooked sticks in the fridge for over a week and bake them on demand. And to ensure you don’t get bored with them I’ve concocted 3 different variations, all of which are delectable. For those of you worried, the recent peanut butter salmonella contamination scare does not affect our favorite brand Naturally Nutty, I have confirmed it with Katie from the company who has checked all sources and posted a statement about it on their site. And mark your calendars for January 24th, it’s National Peanut Butter Day. I intend to have something fun planned for that day, any suggestions? 1. Preheat oven to 425 degrees. Peel squash, slice in half lengthwise and scoop out the seeds and strings. Dice into equal sized sticks. 2. Line a baking sheet with tin foil and coat with cooking spray. Place butternut squash sticks in a large bowl. Add oil and the ingredients for the chosen version of fries. Toss with your hands until the fries are evenly coated. Spread onto the baking sheet and cook for 35 minutes, flipping once at the 20 minute mark. 3. Dip the cozy fries in Peanut Sauce. Dip the spicy fries in ketchup. Dip the regular fries in either. On a scale of 1 to 10 (10 being the crispest) I would rate these fries a 7 if consumed within 2 minutes of baking. After that they jump down to about a 3 but they are still delicious and usually don’t last that long anyways. I tested these out on 2 people that like sweet potato fries and 2 people that don’t like sweet potato fries. All 4 of them love these and can’t get enough of them. I don’t recommend keeping the cooked fries for leftovers, they get mushy very fast. Instead, reserve the uncooked but cut-up fries in sealed containers in the fridge. Then, simply remove them from the fridge and proceed from step 2. They will last for over a week in the fridge this way. I’m not sure how much longer they’ll last because they’re always gone by then. Maple syrup? Wow, never would have thought of that! Tasty ideas! Butternut squash fries…peanut sauce…brilliant! Thanks for the tip about cutting the squash and storing in fridge. That is helpful as I find myself cutting one almost everyday. Good to know they’ll keep. the real question is, when is it NOT peanut butter day for most of us, eh? Peanut Butter Day?! I had no idea. FUN! Love the squash fries recipes. I usually make mine plain but next time I’ll try the spicy variation. I think we’ll have them again tonight! Yum! Yum. I love these – although I don’t think I could eat them for breakfast, lunch and dinner. Way to go, finding something else to scoop up all that PB with. wow! i’ve never thought of doing BN squash fries. they sound so good! I just love it! Love the idea of syrup fries in PB! Definitely going to try the cozy version! YUM! YUM! I can see why you ate over and over. I would too! Never heard of doing this, but I will be. Oh, my, yes, please, I’ll have some butternut squash fries. On a scale of 1-10, with 10 being the crispiest, how crispy would you rate these fries? PS I love the name “Cozy Fries.” And I wish I was having dinner at home tonight because I’ve got a butternut that’s been begging me to cook it. I just finished using up a butternut squash. Next time! I’m not a big FRY eater either, mostly because of their non-nutrition factor, but love oven fried sweet potatoes, next I’ll try the squash! Boy, there’s a Nat’l PB Month and Day! Special! Looks great! I definitly have to try this recipe! i *love* b’nut fries. so delicious. peanut butter day is every day :) Can’t wait to see what you have up your sleeve! What an awesome alternative to potatoes!! I love all your versions! And how cool that you can cut them up ahead of time so their ready to go when your hungry. Can’t wait for National Peanut Day, I know you’ll wow us with something good! I love sweet potato fries! I usually bake them with a little olive oil, then top them with some chopped, fresh basil and sea salt when they come out of the oven. Sooo good. Can’t wait for Peanut Butter Day! They look gorgeous and like you said they tend to get mushy very soon. Just like zucchinis… but I bet they taste good right out of the oven. salmonella in peanut butter…now that is a scary thought. What a great recipe! I just made carrot and tofu fries I will have to try these! Great idea for a tasty side dish. Good idea! I’ve tried sweet potato fries, which look very similar, but never butternut squash fries. With my sweet potato fries, I mix them with some egg white so that they’ll crisp up more. Maybe that would work with these too. I like the variations. TI’m sure the maple one would be really good. Oh yummy. Happy National Peanut Butter Day! (a little early) How about staging a Peanut Butter sandwich eat in? Or a round-up of pictures of people eating peanut butter sandwiches? I found you through Tastespotting. This picture is magnificent and I absolutely love your 3 ideas for butternut fries. “Cozy Fries” is the cutest name ever and I can’t wait to try them. I’m so glad you tried them! Aren’t they amazing?! LOVE yam fries and butternut squash fries. I just cut them up, put them on parchment paper, and then sprinkle black pepper and cumin over them. Delicious. Will have to try your variations though! Hi There, I just stumbled upon your blog, and am very intrigued by what I see. I’m looking forward to following your posts! You said it…these do look AMAZING! The charred edges are the best. I’m SO GOING to make these. thanks! I’ve never heard of butternut squash fries, just sweet potato. I’m definitely intrigued and will give these a try. I love your creative variations too! I really like the sound of squash fries! These look great, but I have the hardest time peeling and cutting butternut squash — unless you have any tips to make it easier, I may have to stick with sweet potato fries. Can pumpkin be used ? as in fresh pumpkin? Espcially with Nut Butter and Cinnamon. Or Ketchup! But then again, what isn’t? Yup yup! Couldn’t agree more! And it works with other kinds of squash too – I just made some great fries with Acorn Squash and Kabocha Squash. Turnips and Parsnips work great too! Why could’nt you fry these in oil? You could! This was just a healthier alternative. I haven’t tried frying them in oil, but it should work great! The reason i asked is because everyone is into sweet potatoe frys. Every where i go on the internet they are making fryed sweet potatoe’s.I was just wondering if you fry them like that is all. Oh yes, sweet potato fries are VERY popular now. 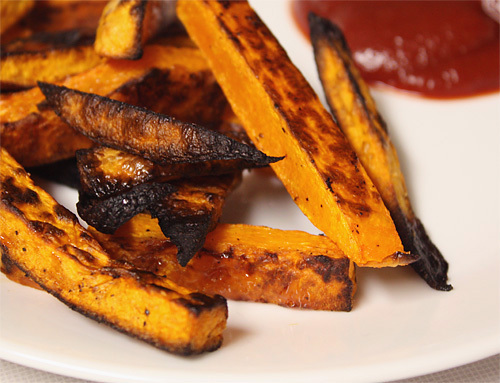 You can bake or fry sweet potatoes fries and the same thing goes for butternut squash fries – either bake them (like my recipe) or throw them in a deep fryer! Enjoy! Get Togetha :: Soulful. Living. » Butternut Squash Fries!